A jetski racing game. 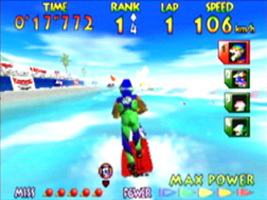 Choose from the four jetski racers, each with their own racing stats, and race three laps around each circuit, placing first at the goal line. While you can ride anywhere on the water, stay within the boundaries and steer around the buoys. The movement of the water affects the way your jetski handles. A calm lake will give you a straight run, while choppy waters will throw you off course. Perform stunts over ramps or waves to increase your Max Power meter and your top speed. Miss a buoy and your Max Power meter is reset. As well as the main Championship, you can race for the best time in Time Trial, go for a hi-score in Stunt Mode, or play a 2-Player race in 2P VS.